There are normally three application cycles a year. (NOTE: in 2019, there will only be two application cycles per year, in the Spring and Fall). This comprehensive inquiry is designed to yield a holistic picture of an applicant business's work to promote bicycling both internally and externally. Most questions are multiple choice, but write-in fields can be used to provide more details. 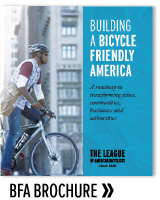 This comprehensive inquiry is designed to yield a holistic picture of an applicant’s work to promote bicycling. Before the application is submitted, applicants can upload supplemental material such as photos and other supporting materials that will be reviewed by the judging panel together with the application. After a deadline, League staff will send each applicant a link to a short survey to share with employees, customers, and guests to provide input on their experience bicycling to the business, and also seek input from local bicycle advocates who may be familiar with the business. These local reviewers usually have 2-3 weeks to submit an online survey. Once all feedback is received, it is shared with the judging panel which then takes about 3-4 weeks to review each application, together with any supplemental material and the local feedback. To learn more about the application process, visit the Getting Started page. Usually show excellence across the board. These are the type of businesses that have excellent bike parking, showers, lockers, incentives to get people riding, great bike education programs and events, supportive policies and a strong biking culture seen both internally and externally. Do have strong bike cultures as well, but may still be missing something in one of the E’s. Feel bicycle friendly but might not be reaching the biggest group of people who would like to bike but don’t feel comfortable doing so. Typically there is still a lot of work left to do in 2 or 3 of the Es. Do not necessarily feel very welcoming to bicycles. These businesses may only have good bike parking, participate in the annual bike to work day or support an internal bike club. However, important steps are being taken in all Five E’s but particularly in one or two E’s. Applicants in the Honorable Mention category are just starting to address the needs of cyclists. There are probably a small percentage of employees, often very experienced riders, who are bicycling to work. 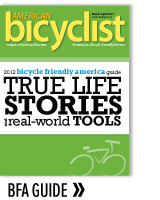 Applicants that do not receive any recognition have yet to address the needs of bicyclists. 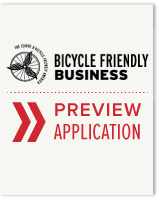 Every applicant receives a feedback report that will help them on the road to becoming a great Bicycle Friendly Business. More information on these guidelines.